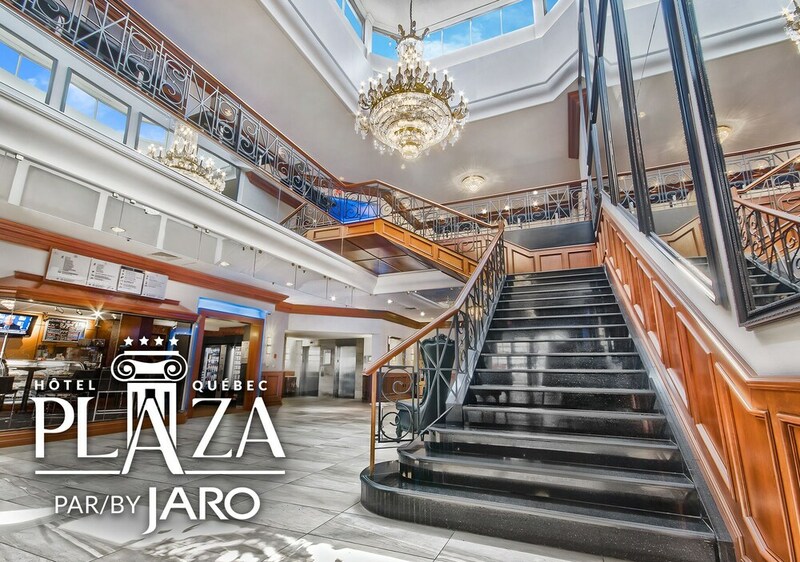 Located in Quebec (Sainte-Foy-Sillery-Cap-Rouge), Hôtel Plaza Québec is within a 5-minute drive of Laurier Quebec and University Laval Hospital. This 4-star hotel is 0.9 mi (1.5 km) from Place Sainte-Foy and 1 mi (1.7 km) from Place de la Cite. Stay in one of 233 guestrooms featuring flat-screen televisions. Complimentary wired and wireless Internet access is available. Bathrooms have complimentary toiletries and hair dryers. Conveniences include phones, as well as safes and desks. Relax and unwind with massages and facials. You can take advantage of recreational amenities such as an indoor pool, a spa tub, and a sauna. Additional amenities at this hotel include complimentary wireless Internet access, concierge services, and babysitting/childcare (surcharge). Enjoy international cuisine at Ginger Pub-Grill-Lounge, a restaurant which features a bar, or stay in and take advantage of the room service (during limited hours). English breakfasts are available daily from 7 AM to 11 AM for a fee. Featured amenities include a 24-hour business center, express check-out, and dry cleaning/laundry services. Planning an event in Quebec? This hotel has 7115 square feet (661 square meters) of space consisting of a conference center and meeting rooms. Free self parking is available onsite. In addition to an indoor pool, Hôtel Plaza Québec provides a spa tub, a sauna, and a fitness center. Dining options at the hotel include a restaurant and a coffee shop/café. A bar/lounge is on site where guests can unwind with a drink. A computer station is located on site and wireless Internet access is complimentary. This 4-star property offers access to a 24-hour business center and meeting rooms. Event facilities measuring 7115 square feet (661 square meters) include a conference center. This family-friendly hotel also offers a terrace, an arcade/game room, and multilingual staff. Onsite self parking is complimentary. A total renovation of this property was completed in January 2016. Hôtel Plaza Québec is a smoke-free property. English breakfasts are available for a surcharge and are served each morning between 7 AM and 11 AM. Ginger Pub-Grill-Lounge - This restaurant specializes in international cuisine and serves breakfast, lunch, and dinner. Guests can enjoy drinks at the bar. Happy hour is offered. Open daily. Ginger Sushi-Bar - Onsite sushi bar. Open daily. The minimum check-in age at this property is 18 years old. Guests must provide a valid driver's license or passport at check-in. For more details, please contact the office using the information on the reservation confirmation received after booking. Cribs (infant beds) are available for CAD 15.0 per day. This hotel will place an authorization for the cost of stay at 6 PM for any bookings where payment for the stay will be made on site instead of at the time of booking. Declined credit cards may result in a cancelled reservation. For more details, please contact the property using the information on the reservation confirmation received after booking.